What should a company do when it's in trouble? Well if you're BlackBerry apparently it's launch a premium smartphone for the high rollers - introducing the BlackBerry Porsche Design P'9982. 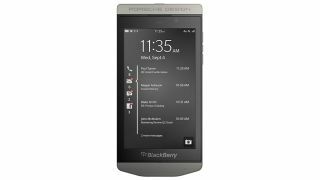 While it's got an all-new name and the Porsche Design branding splashed across its front, the P'9982 is actually a humble BlackBerry Z10 in a swanky Italian leather and stainless steel suit. The only hardware difference is the P'9982 comes with a sizeable 64GB of internal storage, trumping the paltry 16GB found in the Z10. That means you get the same 1.5GHz dual-core processor, 2GB of RAM, 4.2-inch 720p display, 8MP camera and the latest BlackBerry 10.2 OS - the P'9982 is certainly going for style over substance, then. What you do get is an official certificate of authentication in the box, plus an exclusive BlackBerry pin which starts "2AA" to let everyone know you're part of this elite club. In terms of on-screen goodies the P'9982 comes with a grey wallpaper (yes, plain grey), a special Porsche Design ringtone and a dedicated area in App World. In terms of price, this smartly dressed Z10 is going to set you back a fair bit, although the exact price hasn't been announced. TechRadar has been told that it'll sport a similar price tag to the previous Porsche Design smartphone - the P'9981 - which retailed at around £1,500. Update: BlackBerry has told TechRadar "information on pricing for the P'9982 will be announced through Porsche Design and other retail partners. The suggested retail price for the P'9982 smartphone is £1450." Meanwhile the Z10 can be yours for just £200. At that price you'd think that the P'9982 would be a limited edition phone, but BlackBerry has said it'll sell as many as it can - so if you really want one you won't need to know "someone on the inside." If you're sold then you'll be able to nab the Porsche Design P'9982 from November 21 in selected retailers around the world - with Harrods in the UK getting the handset exclusively from that date. Update: The P'9982 will be available at Carphone Warehouse from November 25 for £1400 SIM-free and Selfridges at a later, currently unspecified date.